CSEA members, led by Metropolitian Region President Lester Crockett as parade chair, march in the New York City Labor Day Parade. CSEA members participated in Labor Day events across the state. While events ranged from picnics to parades, they all sent the same message: we are staying union and staying strong! Parade. Photo by John Normile. Region President Kathy Button and Long Island Region President Nick LaMorte, and labor supporters wore red carnations to honor Tripi and her contributions to the labor movement. 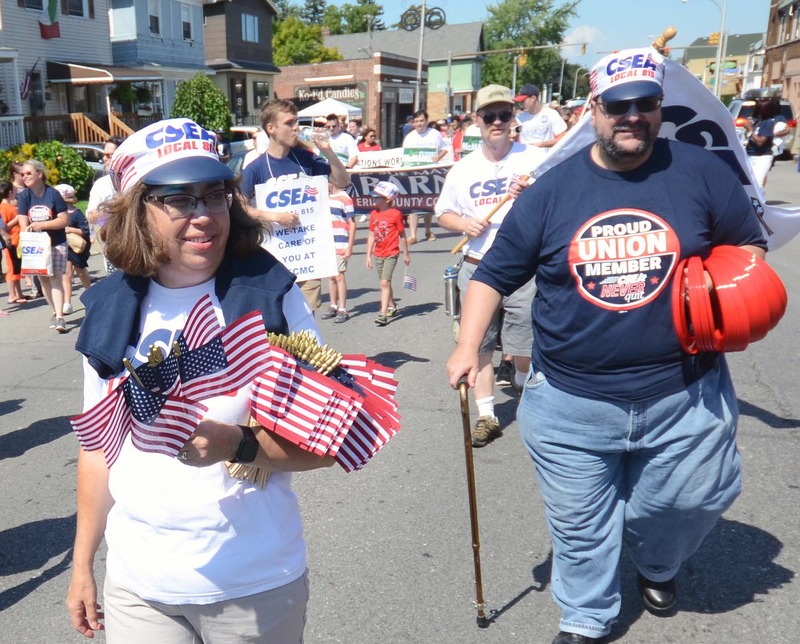 CSEA President Danny Donohue joined Central Region President Colleen Wheaton and region activists for the Syracuse Labor Day Parade and Rally at the New York State Fairgrounds. These events capped our participation in the New York State Fair. Our members in St. Lawrence County also got into the Labor Day spirit through participating in the Massena Labor Day Parade. In Albany, Capital Region President Ron Briggs and region activists joined other labor unions for an evening parade and picnic. Metropolitan Region President Lester Crockett served as the parade chair of this year’s New York City Labor Day Parade. Joining Crockett were Statewide Secretary Denise Berkley, LaMorte and our members from the Long Island, Metropolitan and Southern regions. CSEA Western Region President Kathy Button talks with Long Island Region President Nick LaMorte at the Rochester Labor Day Parade. Long Island, Metropolitan and Southern Region members are staying union and staying strong in the New York City Labor Day Parade. CSEA Erie County Local Executive Vice President Bill Wilkinson passes out posters and other decor during the Buffalo Labor Day Parade. Photo by John Normile. 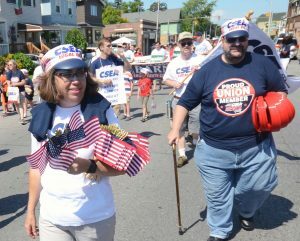 CSEA members and their families turned out to march in the Labor Day Parade in Massena. Photo provided by Amy Simmons. CSEA Executive Vice President Mary E. Sullivan pays tribute to former Western Region President Flo Tripi at the annual pre-parade press conference in Rochester. CSEA members and their family members joined CSEA President Danny Donohue and our Central Region Officers in leading the Labor Day Parade at the State Fairgrounds in Syracuse. From left, front row: Central Region Officers Nicole Meeks, Ken Greenleaf, President Colleen Wheaton, Casey Walpole and John Brown. Erie County Local President Denise Szymura, front left, and members show they are sticking with our union during the Buffalo Labor Day Parade. CSEA Statewide Secretary Denise Berkley is second from right, third row. Photo by John Normile. Statewide Secretary Denise Berkley, Metropolitan Region President Lester Crockett and Long Island Region President Nick LaMorte show their pride in New York City. CSEA President Danny Donohue speaks to the crowd assembled before marching in the 2018 Syracuse Labor Day Parade. SUNY Stony Brook Local President Carlos Speight and SUNY Stony Brook Local Treasurer Dawn Herritt are happy to march in the New York City Labor Day Parade with their union brothers and sisters. CSEA Erie Educational Local member Patty Reitz, right, and her daughter, Bridgit Reitz, march in the Rochester Labor Day Parade on September 3. Reitz drives a school bus for the Clarence Central School District, and has been driving for 25 years. Long Island Developmental Center and Sagamore Children’s Psychiatric Center Local President Pete Marriott and Local 1st Vice President Jennifer Colon march in the New York City Labor Day Parade. CSEA members, including Sodexo at Monroe Community College Local Vice President Angel Pride, second from right, march in the Rochester Labor Day Parade.